Using P. vulgaris (common bean) as a model system my PhD research has focused on the impact of abiotic stress, particularly drought and phosphorus deficiency, on photosynthetic capacity and the translation of resources into a developing seed. Initial discussions with my PhD supervisor, Dr. Andrew Merchant, kept coming back to the same problem of our inability to fully understand source-sink dynamics if we couldn’t measure sink strength. This eventually led us to a portable NMR sensor, developed by Dr. Carel Windt and others at the Institute of Bio- and Geosciences (IBG-2) at Forschungszentrum Jülich (FZJ). FZJ is a large interdisciplinary science research centre set in a beautiful forest close to a town called Jülich, in the west of Germany. The mobile nuclear magnetic resonance sensor (NMR) allows for the non-invasive, real-time measurement of water status and dry matter accumulation over seed development. Due to the portable and compact nature of the sensor it may be used to analyse components of a whole fixed plant, for instance a developing fruit (see Windt et al. 2011). 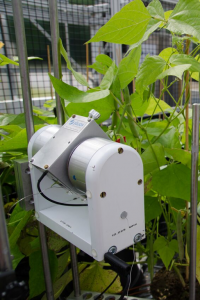 During the first year of my PhD, I worked closely with Dr. Carel Windt to assess the suitability and application of the NMR sensor in common bean. This initial visit to Jülich was the first time the NMR sensor was applied to a biological question. It was an important first step as we were able to complete a calibration and an experiment during this time. I have learned a lot since that initial visit and thanks to the support from the Australian Society of Plant Scientists R.N Robertson Travelling Fellowship I was able to return to Jülich this year. Having previously visited for a short time in 2014 made it a little easier this time around. Not only did I have the knowhow for navigating the huge “SeeCasino” cafeteria, so lunchtime wasn’t as confusing, I also had a better understanding of the NMR methodology that we were able to apply to our experiments and answer some new questions. We planned two separate experiments both aiming to manipulate source strength and observe whether we are able to detect a change in pod loading rates. One experiment was completed in a small climate chamber where we altered lengths of light-dark periods in an attempt to assess whether changes in starch cycling would impact on the developing grain, in particular the timing and magnitude of such an effect. The other experiment completed in the glasshouse using a multiplexed NMR system (6 NMR sensors all attached to the 1 spectrometer so we can measure lots of plants at once and keep measurements consistent) altered source strength of plants by pruning to investigate whether we could detect changes in loading rates within the sink tissue compared to plants that weren’t pruned. While the glasshouse experiment didn’t go exactly as planned towards the end when a European “heat wave” stopped measurement time, what we found from both experiments was exciting and unexpected. Our results showed that under a range of conditions where source strength was manipulated, for instance a week in the dark and/or significant pruning (80% leaf area removed), loading of dry matter into the pod stayed the same as prior to the treatment or relative to the control. This result has sparked my interest and made me consider whether pods are more independent of leaves than we had previously thought. Overall my time in Jülich was amazing. 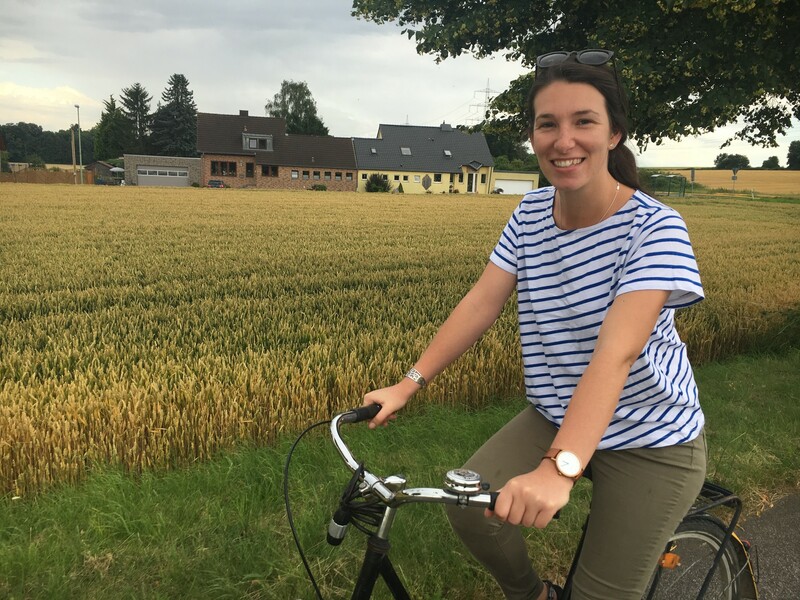 It was nice to have a taste of European life; I enjoyed riding my bicycle to the institute (on the days when it wasn’t raining) through the fields and forest, I loved trying different unpronounceable German bakery treats and sitting in the town square having a beer from the pub. It was great to be in Jülich for the biannual open day Tag der Neguier where I could join thousands of others when FZJ stopped their strict security checks for 1 day for citizens to come and discover the interesting research that they do and share in the excitement and passion that everyday Germans have for science. I have come away from my visits to Jülich with lots of exciting data for my thesis (and some papers) but most of all I left knowing that I had made connections with leaders in my field, been exposed to interesting and novel ideas and technologies that I might have considered impossible before and confidence in my ability to collaborate, communicate and initiate my ideas. I am incredibly grateful to the ASPS for awarding me an R.N Robertson Travelling Fellowship, to Carel Windt for inviting me to FZJ and the many others in the Emerging Technologies group for the lunchtime conversations and help, and finally to my supervisors Andrew Merchant and Tom Buckley who have encouraged me to collaborate and pursue interesting scientific questions. I arrived in Japan in late June, and it was already beginning to heat up, with relentless humidity and frequent rain. When I arrived on the express train into Tsukuba from Tokyo though, the weather seemed to fit nicely with the scene before my eyes – fields of rice paddies as far as the eye could see. 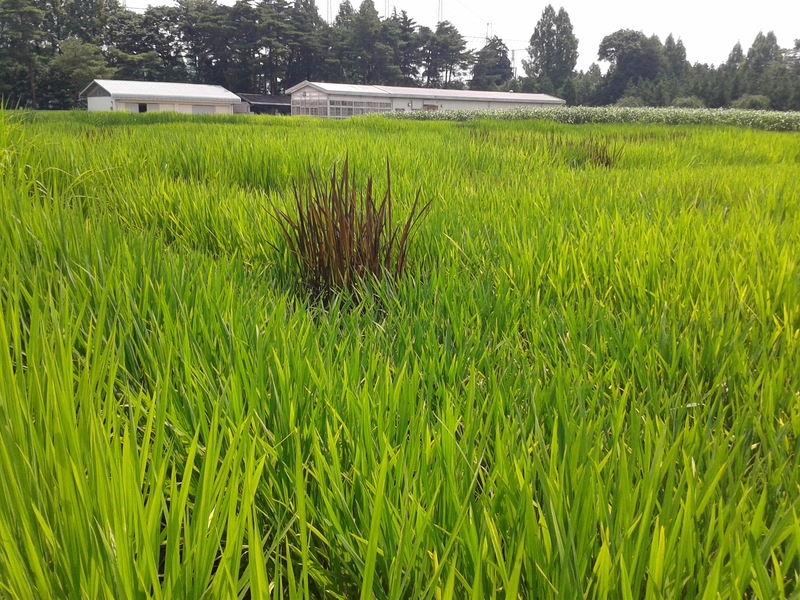 All of them growing luscious, green, heathy rice plants. Rice was the reason I came to Tsukuba, in fact. Through the generosity of the ASPS and the R.N. Robertson travelling fellowship, I was able to visit the lab of Prof. Matthias Wissuwa at the Japan International Research Center for Agricultural Sciences (JIRCAS, for short). JIRCAS is located a short bike ride out of central Tsukuba, dubbed the ‘Science City’ of Japan, which is home to countless research institutions and its own University. It is located 65 km out of Tokyo, and is a buzzing hub of science, technology, and home to many foreign researchers. Prof. Wissuwa is an expert in phosphorus (P) and zinc (Zn) nutrition in crop plants, working primarily with rice. My PhD research so far has focused on arbuscular mycorrhizas (AM) and plant P and Zn nutrition, so it fit nicely with what was already being done at JIRCAS – except with the added factor of AM. 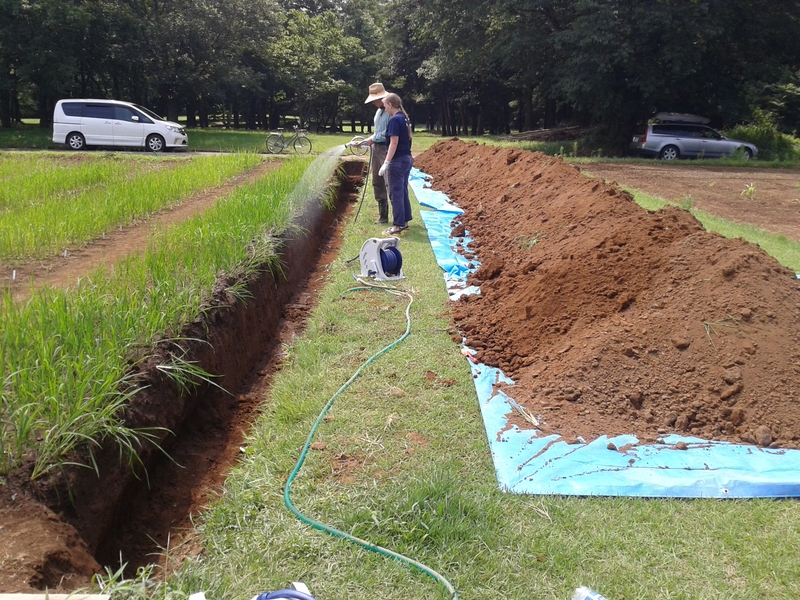 While at JIRCAS, I sampled roots of different rice genotypes growing in Low P and High P fields, that ranged widely in their root morphology, biomass, and P uptake. Barely any work with regards to AM had been done on any of Prof. Wissuwa’s rice genotypes, although there were some preliminary data on extent of mycorrhizal colonization that helped us to select four varieties to focus on. With just a couple of weeks to analyse my root samples, I focused on two main tasks – staining roots to visually quantify the extent that they were colonized by AM, and quantifying the expression of the mycorrhizal-induced P transporter – OsPT11, by qPCR. I also spent a lot of time helping other people with their work, whether it be harvesting plants, sampling in the field, or maintaining the field sites (weeding). 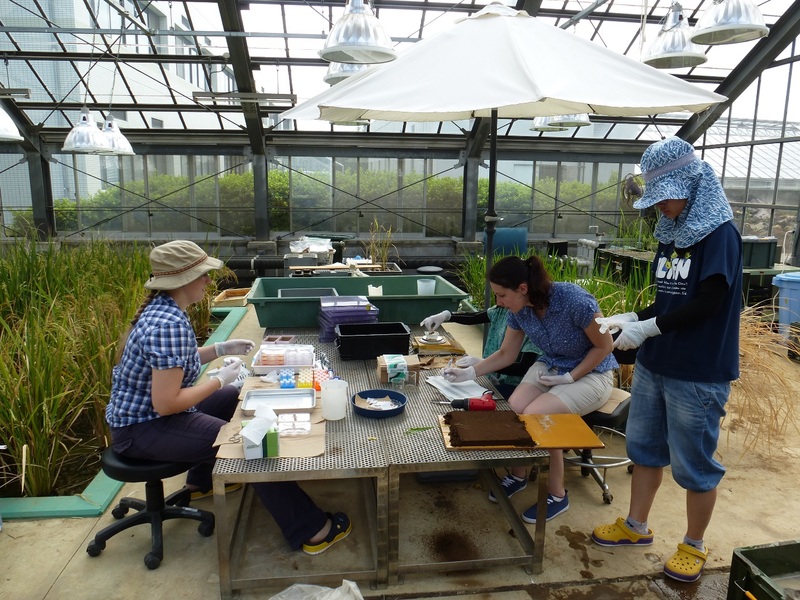 The results were interesting, and demonstrated that the different rice genotypes varied greatly in their expression of OsPT11 and also in percentage of root colonised. This may point to the potential for AM to improve the P nutrition of rice, and further exploration into AM enhancement of rice nutrition will be of interest. Thank-you to the ASPS for bestowing the RN Robertson fellowship upon me so I could make the most of my visit to JIRCAS. Funding through the RN Robertson Travelling Fellowship by the Australian Society of Plant Scientists allowed me to visit the laboratory of Assoc. Prof Margaret Barbour at The University of Sydney’s Camden Campus and work with Dr. Kevin Simonin and Dr. Xin Song to investigate water pools in grape berries using novel stable isotope techniques. As part of my previous Masters by Research and my current PhD at The University of Adelaide some of my research focuses on how different water pools in plants are integrated in the transpiration stream. During my Masters by Research, I investigated pre-harvest berry dehydration in Australia’s most popular red grape variety Shiraz, which can lead to significant yield losses. Berries that are affected show an imbalance between water uptake and water loss at the end of ripening causing shrivelling of the berries and concentration of sugars. This may make these berries less suitable for wine production. When I presented my research at COMBIO 2012 in Adelaide, I was introduced to Assoc. Prof. Margaret Barbour and Dr. Kevin Simonin form The University of Sydney, who presented a poster on a novel stable isotope technique that they used to investigate changes in stable isotope composition of water in the leaf during transpiration. We discussed that this technique could also be used to investigate the contribution of different water pools to the transpiration stream in grape berries. This could reveal the sources of water which are lost during pre-harvest berry dehydration. At the beginning of 2013, I was fortunate to win a scholarship to visit the workshop “Stable Isotopes in Biosphere Systems” at The University of Sydney’s Camden Campus. This workshop gave me a great overview about this topic that was completely novel to me and experiments that were part of the workshop demonstrated many different techniques that can be used to investigate the environment and plants using stable isotope techniques. Encouraged by this workshop, I applied for the RN Robertson Travelling Fellowship to return to The University of Sydney and work on a project with the aim to use stable isotopes of water to trace water movement through developing grape berries. My successful application for this fellowship gave me the opportunity to return to Sydney at the beginning of this year. For our experiments we used source water slightly enriched in H218O to allow calculations of berry water turnover time. 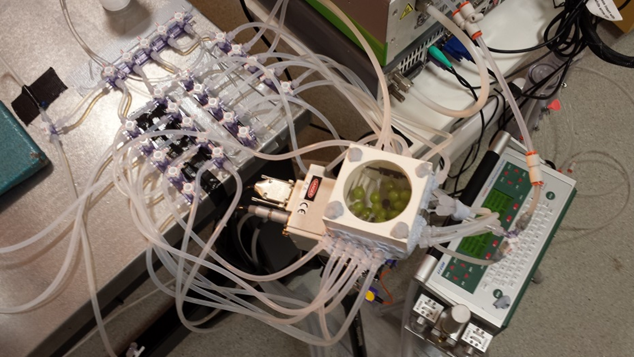 Up to 20 individual berries attached to tubing for source water uptake were enclosed in a gas exchange cuvette, which proved to be better than using intact grape clusters (Fig. 1). Source water uptake was measured gravimetrically, and air leaving the cuvette was analysed by an infra-red gas analyser and an isotopic water vapour analyser. Our experiments showed that pre-veraison berries had a turnover time for water of 2.5 days, and that 60% of the water within the berry was involved in the evaporative flux. The remaining 40% of the berry water appears to be hydraulically disconnected from the flow of water. Figure 1. Sixteen berries, each connected to the source water by tubing, are enclosed within a gas exchange cuvette. Air leaving the cuvette, is sampled by an infra-red gas analyser and an isotopic water vapour analyser. At the end of this year, I’m planning to return to Sydney to quantify the turnover time and degree of hydraulic connection for berries of different varieties, and at different stages of development. We will also experimentally modify water exchange between symplastic and apoplastic water pools by using chemical blocker substances that are known to change water permeability of aquaporins, which are molecular water channels in cell membranes. By directly extracting symplastic and apoplastic fluids from berries at different times of the experiment, we also hope to gain direct evidence for different rates of water enrichment for these two pools. I’m very grateful to the Australian Society of Plant Scientists for funding my project, which gave me the opportunity to learn this new exciting technique and apply it to my research on grape berry water relations. I would also like to thank Assoc. Prof Margaret Barbour, Dr. Kevin Simonin, and Dr. Xin Song from The University of Sydney for inviting me to their laboratory and their help with the experiments, and my supervisor Prof. Steve Tyerman from The University of Adelaide for his support. Thanks also to Ms Wendy Sullivan, who took care of the grapevines, at The University of Adelaide.